→ GOOMW! A scrolling game? Kiwi released a program and an open source to show how to scroll 8 directions on Colecovision. So I write down the code and compiled it. It's incredible! So I start thinking: how about making GOOMW! to scroll, once the player beat down all opponents and go to the next screen, the background should scroll, like most brawler games do. Kiwi's only uses four tiles in his program. Mine would need over 20 tiles to deal with. 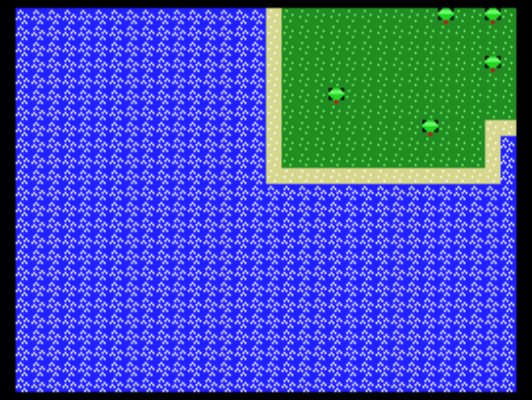 I'm aware adding scroll in my game would take more resources of Colecovision and take more rooms as well. You can comment out or erase the last 4 lines in Scroll(); to use that last 4 rows for the status. ICVGM, if you mouse over the name table area, you get the tile ID, C=, number in both decimal and hexidecimal format. So the number in the map represent the tile ID. Exporting to C not using the RLE compression will give you the hexidecimal table. Each rows have 16 entries, so combining 2 row will make 32 entries per row horizontally. Enabling column feature in Notepad++ will make appending data table horizontally much easier. Alternately you can use Tilestudio to help you map your level as it can output in C data format.